Curl up with the comfort of this exceptional foam and fiber pillow. The unique design incorporates the very huggable attributes of a fiberfill pillow while maintaining the contour plush support of memory foam for an outstanding sleep companion that'll last for years to come. Ive purchased this pillow before and the beautyrest fiber and memory foam pillow is the perfect amount of softness and support. Perfect for guestroom or for everyday use. BUT the last delivery arrived with the pillows soaking wet. I'm sure Overstock will replace them without a hassle. This pillow is ok. I was hoping that it would offer more support but for the price point, I can't complain. I would not recommend this to anyone who is looking for a memory foam pillow. At first I was a little hesitant to order a pillow that I hadn't tried first because I fully intended to sleep on it for 8 hours a night for a long time. I'm very glad I did though. The medium pillow is extremely comfortable and gives me exactly the amount of support I need. What I like most about these pillow is that they are fluffy and semi-firm and they hold their shape - they aren't flat and limp like my old pillows. Although they have a bit more loft to them which I have to get accustomed to. So far, there isn't anything that I dislike about our new pillows. Yes, I would recommend to a friend, but maybe the soft pillows rather than the medium soft. These pillows are fantastic! So soft but firm enough too. The perfect combination. I usually sleep with two pillows, but with these I can sleep with just one. 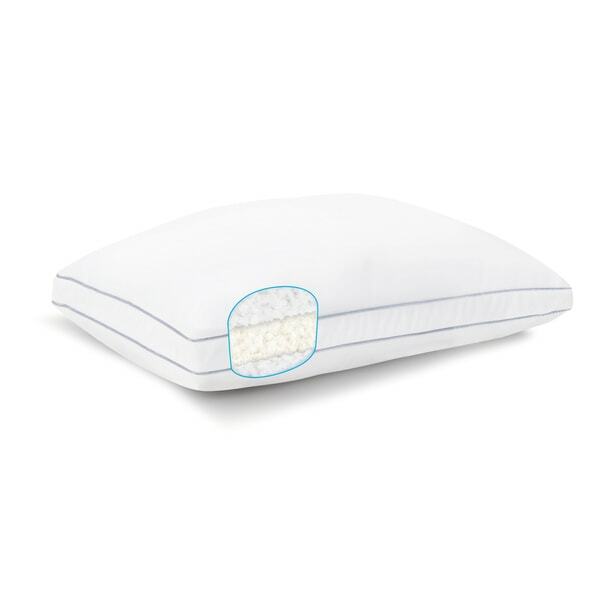 This pillow is absolutely incredible for Someone with back and neck pain this pillow is really excellent and for the price I am completely pleased! Just got these pillows in today, so excited, their so smooth and soft. Perfect for a good night sleep! Great price also! Don’t miss this great deal! I've been looking for a pillow with enough support that also "gives" while sleeping. Highly recommend! Well-made and have held up incredibly well. My partner loves them, too! Great pillows.... not too soft not too hard it’s perfect!!!!! Bought these as a gift for my daughter who was suffering during a terrible heat wave. They helped her stay cool and were just the right firmness for her. Great investment and good Mom points--How could you go wrong.